Home > News - SEPTEMBER 2016 > Indian Consumers purchasing online more frequently. 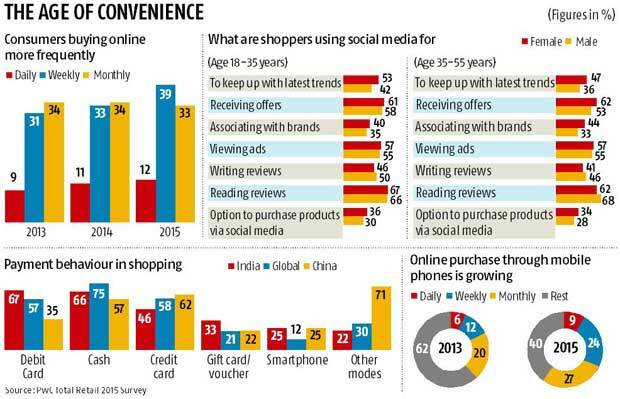 Indian Consumers purchasing online more frequently. Increasing number of consumers in the country are embracing online buying and their frequency of hitting the e-commerce platforms is growing, a joint report, titled ‘Shaping Consumer Trends’ by industry body FICCI and PwC, said. While, in 2013 only nine per cent of the consumers surveyed used online channel to purchase products on a daily basis, in 2015 the share had gone up to 12%, the report said.